Sometimes I've sat in crowded airports, or in a corner at bustling parties and listened to the buzz of chatter all around me. More than once I've thought an argument could have been avoided or a misunderstanding assuaged with just a few different words. As humans we were given the miracle of speech. That wondrous volley of odd sounds that stream out of all of our mouths was not bestowed upon the beasts of the earth, at least not in the manner in which we use it. The approach we use in speaking with others says volumes about our own character, and has the power of instantly putting someone at ease or shunning them. With just a few carefully chosen words it makes a huge difference in how others perceive us and ultimately relate to us. My personal rule of thumb is if I'm going to say something, let it be words that will not cause me grief or regret later. Of course a rule such as that must be broken in today's complicated society, but regardless it has served me well. I've traveled a great deal during my life and I've been privy to rude service just as many times as I've been treated kindly. I cannot tell you the difference it makes when someone speaks politely and caringly with you as opposed to the person who seems to glean pleasure out of being the nastiest they can be. 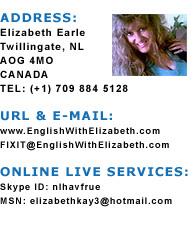 English With Elizabeth is my home where I try to present a better method of English usage. However, when it comes to language, any language, the manner in which your words are delivered matters little what dialect you speak. Many's a time I've sat in a European pub, unable to understand any of the chatter, yet I knew exactly who I should like to speak with were I able to. Kindness, understanding, politeness and gentleness of spirit isn't hidden within languages we cannot understand. The method which my fellow pub patriots were using to communicate was clearly apparent, and I had no trouble sorting out the kind and polite from the rude and impolite. We were given the power of speech, of language, of communicating. It is not necessary to shout or wave our arms around or even insert harsh expletives just because we feel bad within ourselves. As humans, no matter what your mother tongue is, you have the power of ensuring your friends and family understand you because you can 'speak'. The next time you find yourself on the verge of opening your mouth and beginning a sentence, no matter who it is that's about to receive your words, think first. Remember ..just as surely as the eyes are the windows to our souls, language is the pathway to our hearts.